This warming blend of MSM, capsicum, vitamin B3, aloe vera and essential oils of boswellia, ginger, black pepper, rosemary, eucalyptus, cornmint, peppermint and lemongrass has been specially formulated to help warm joints and muscles before exercise and activity. 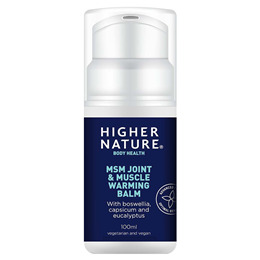 The Higher Nature MSM Balm also helps to ease tired, stiff muscles, joints, tendons and ligament. With antioxidant vitamins C, E and mixed tocopherols. After about ten minutes the full effect of this balm will take effect, when all the active ingredients are fully absorbed by the skin and had time to help support muscles and joints. All the active ingredients work in synergy to produce this support. Aqua, alcohol denat., dimethyl sulfone (MSM), pentylene glycol, glyceryl citrate/lactate/linoleate/oleate, triethanolamine, carbomer, tocopheryl acetate (vitamin E), oil blend: Eucalyptus smithii, Eucalyptus globulus, Rosmarinus officinalis, Mentha arvensis, Boswellia ferieriana, Zingiber officinale, Mentha piperita, Piper nigrum, Cymbopogon citratus; mixed tocopherols, Aloe barbadensis 200:1, ascorbyl palmitate (vitamin C), disodium EDTA, methyl nicotinate (vitamin B3), Capsicum frutescens. For external use only by adults and children over 8 years of age. Test on a small area before applying sparingly to desired area. Avoid applying to the eyes, face, wounds or sensitive areas of skin and do not allow contact with clothes. Wash hands after applying. This is an airless pump. To begin releasing the contents, remove tab and gently depress the nozzle several times. 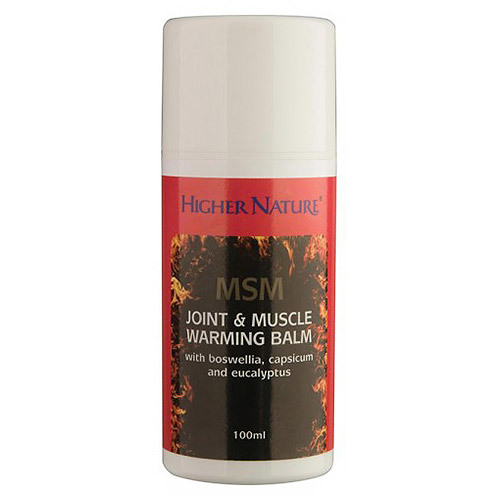 Below are reviews of MSM - Joint and Muscle Warming Balm - 100ml by bodykind customers. If you have tried this product we'd love to hear what you think so please leave a review.